The riverfront gazebo is a prime spot for concerts or hanging out with friends. Seeing is believing! The best way to know if St. Norbert is right for you is by spending time on campus. Come and see for yourself why students pick St. Norbert College as their home. The links below will fill you in on the focus of each program. Or feel free to schedule a personalized visit; our admission representatives and student tour guides love to show off the campus. 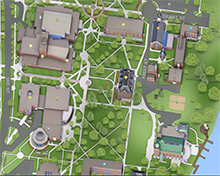 Our interactive campus map and virtual tour videos will also give you sense of what our beautiful campus looks like.